Number six in a series, bookmark http://tinyurl.com/ditko-stories to see them all. This story is still under copyright, so just a few samples here. "Madame Cyanide and Mister Tricks" is a 5-page story from Prize's BLACK MAGIC #29 [v4n5] , the third and last consecutive issue of the Simon&Kirby edited horror anthology with a Ditko story (there's an odd temporal anomaly about seven years later that I write about here). "Mister Tricks" is Nicholas Dana, a professional sceptic who exposes phony mystics and con-men. 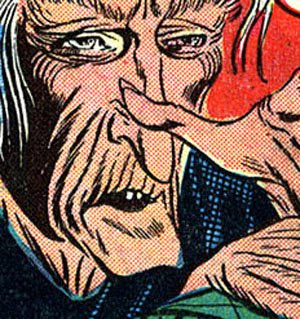 I was about to write that this was like a prototype of DC's "Doctor Thirteen" character, but I just discovered that Thirteen predated this story, in a brief run from 1951-1952. 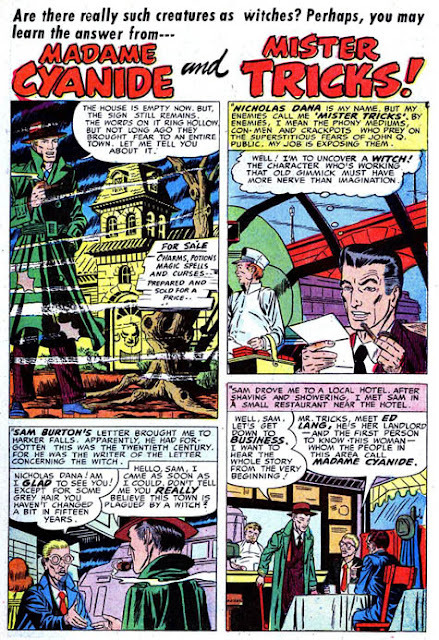 And drawn by Leonard Starr, who did some work for the S&K shop (though pre-dating Doctor Thirteen), and usually written by France Herron, who worked with Simon various times over the years. Hmm, there's definitely something to this. An unused script modified a year later and given to the new kid? Anyone familiar with Herron's writing from that era (a few of the Thirteen stories are reprinted in the recent SHOWCASE PRESENTS THE PHANTOM STRANGER v1 book) want to weigh in? Most scans in this series adapted to my personal tastes from those found, and available for free download with registration, at the Golden Age Comics Download site. To buy Ditko comics and things on paper, go over here for ordering info on some wonderful creator owned material (including his latest comic, DITKO, ETC...) and over here for info on recent and upcoming publications from all publishers. And subscribe to Rob Imes' revival of DITKOMANIA, now accepting PayPal.